[Update 2] A new The Witcher 3 Blood and Wine gameplay video and details on a returning characters have also come in. You can find everything here. [Update] Now that the embargo is up, the teaser trailer and additional details on The Witcher 3 Blood and Wine expansion have emerged online. NeoGAF user Dmax3901 has put together a summary of all the revealed information. • Over 90 new quests. • Over 40 new points of interest. • Dynamic points of interest system. Killing bandits in their main hideout will affect the number of enemies in surrounding camps. • 14000 lines of dialogue (Hearts of Stone had 6000). • 100 individual pieces of armour (including new Witcher sets). • More than 20 new monsters. • New Game + maximum level increased to 100. • New Witcher armour class ‘Grandmaster’. • New armour merchant who is the only one able to craft this level of Witcher gear. • Can get blue, hooded armour from Witcher 2, armour from Witcher 1, Ursine Witcher armour with furry pauldron that was in the artbook but cut from the main game. • More than 30 new weapons. • Can now dye armour. Dyes can be bought from a merchant, crafted or looted. Only obtainable in Toussaint. Pink is among the colours. • You can acquire the golden, plumed armour of the Touissant knights, and the same goes for Roach! • Mutations. 12 new abilities. Mechanic is unlocked through a quest started by a letter from Yennefer. Examples: Signs can have critical hits causing the enemy to explode, instead of dying Geralt is healed and has damage immunity, opponents knocked down by AARD freeze and die instantly. Can only utilise one at a time. • The UI resembles Witcher 2’s character customization screen. Basically they’re super strong abilities/stat boosts that require mutagens and skill points to unlock. Can only pick one at a time but you have to unlock earlier ones to get the others. • Despite unlocking it at level 34+ (recommended level to venture to Touissant) the system and anything you’ve unlocked carries over to New Game+ so you won’t have to unlock it again. • Greatly redesigned User Interface. • Can now rotate Geralt in stats screen. • Books moved to glossary. • Upon looting a readable item a little notification pops up in bottom left of screen. Upon clicking in the right stick (on Xbox One controller), you can read the text of recently looted books, letters, notes etc without having to go to the menu, inventory, finding the right book and so on. • Option to remove fish-eye effect from witcher sense. • Geralt gets his own motherfucking vineyard. • It’s called Corvo Bianco. • You can renovate it with large sums of money, the option I saw was for 5000 Orens. • You can add a greenhouse of sorts where you can grow herbs for all your witcher potion needs, an armourer’s table, a stable for Roach (with its own stat bonuses), upgrade your bed, renovated interior and exterior, secret lab, guest room. • Guest room where old friends will come to stay. They said the names Triss and Yennefer, but were reluctant to reveal the names of anyone else who might visit. Surprise Iorveth/Saskia visit?? • Scaffolding and workers will appear after you choose to build something. Each change takes a certain amount of in-game time to complete, but you can just meditate til everything’s done. • Can display your armour, weapons, paintings and books. • Some paintings can be bought, or specially made, others are obtained through quests. • Over 2 hours of new musical content in the game. • The title screen song is a reworked version of the Bruxa song from the CGI trailer. • Can enter Geralt in a tournament, creating his own logo and team colours. • Can enter under a fake name, although you may not fool everyone. • You can of course race horses, but other events involve crossbow shooting and a grand melee. Seems like there will be more but they didn’t want to say. • No new unique weather effects, but the lighting has been prepared specially to reflect the feeling of Southern Europe. • As of the preview event (3/5/16) they were still working on the final boss fight. • Grass has been optimised, more of it but less expensive. • Improvements to cloth tech (see interview for more detail). • New sword sheathing option. With this new option Geralt no longer automatically unsheathes his sword at the start of combat. Also, he no longer switches weapons to match the opponent. The player has to do it on their own. • CDPR staff were given a sheet that says “We do not talk about Cyberpunk” for this press tour. • Bioware staff apparently cheered when Witcher 3 was delayed out of 2014. • Nilfgaard and Northern Kingdoms physical Gwents cards exist, unsure if they’re being packaged with this expansion. • Release date “first half of 2016”. [Original Story] Later today, a new trailer for The Witcher 3 Blood and Wine, the second expansion for the popular role playing game released last year on consoles and PC, will probably be shared alongside some new details. As if often happens, more on the matter has come in before the end of the embargo, which is actually in a few hours. Website cnet.com has put up by mistake some new details on The Witcher 3 Blood and Wine. According to the website, the expansion will include over 90 new quests, 40 new points of interests, 20 new monsters and some new mechanics and system. The details have since been removed from the website, but reddit user Wellbidlo managed to transcribe the article. The transcription has also been removed, but we have managed to take a screenshot beforehand. Blood and Wine includes over 90 new quests and 40 new points of interest. It also introduces a dynamic system, where interacting with an area’s main POI affects adjacent points — for example, killing enemies in their main hideout lowers their numbers in surrounding camps. Additionally, there will be 14,000 new lines of dialogue, which is 8,000 more than the previous expansion. New gear and monsters include over 30 new weapons, 100 individual pieces of armor, and more than 20 new monsters. No specifics were announced. 12 new mutations were detailed, however, and players will be able to unlock them in New Game Plus. The mutations include one that causes enemies to freeze and die instantly when knocked by Aard, one that makes enemies to explode when they’re killed with a sign’s critical hit, and another that heals and grants you damage immunity when you lose all of your health. Other additions include the New Game Plus maximum level increasing to 100, a new “Skellige” Gwent deck, and a redesigned user interface. Players will also be able to change the color of their gear with armor dyes that can be obtained through merchants, recipes or loot. However, these can only be acquired in Toussaint. 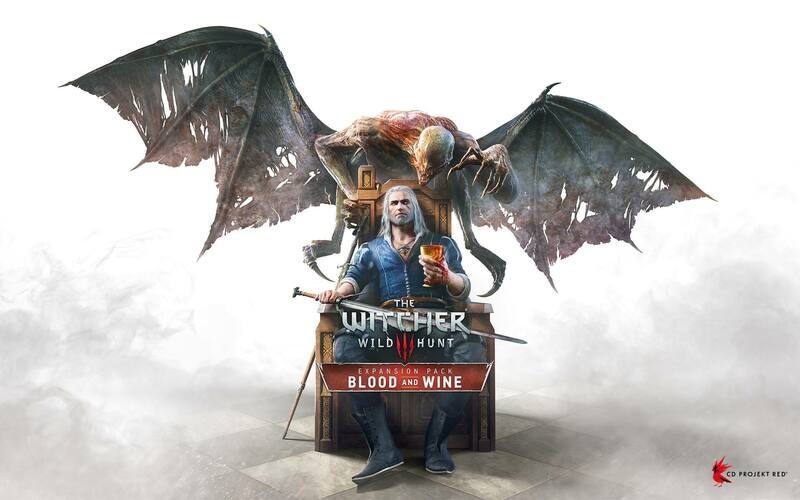 The Witcher 3 Blood and Wine expansion has yet to receive a final release date, but it should be released on May 30th, according to what has been revealed by the expansion’s Steam page a few days ago. We will keep you updated on the matter as soon as more comes in on it, so stay tuned for all the latest news.